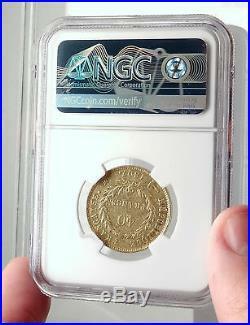 Item: i70552 Authentic Coin of. 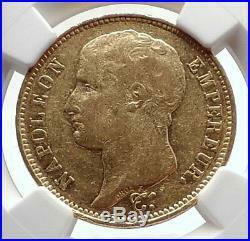 XF 45 4598164-023 NAPOLEON EMPEREUR. As Napoleon I , he was Emperor of the French from 1804 to 1814 and again in 1815. Napoleon dominated European affairs for almost two decades while leading France against a series of coalitions in the Napoleonic Wars. He won the large majority of his battles and seized control of most of continental Europe before his ultimate defeat in 1815. One of the greatest commanders in history, his campaigns are studied at military schools worldwide and he remains simultaneously one of the most celebrated and controversial political figures in European history. In civil affairs he implemented a wide array of liberal reforms across Europe, as summarized by British historian Andrew Roberts. The ideas that underpin our modern world-meritocracy, equality before the law, property rights, religious toleration, modern secular education, sound finances, and so on-were championed, consolidated, codified and geographically extended by Napoleon. To them he added a rational and efficient local administration, an end to rural banditry, the encouragement of science and the arts, the abolition of feudalism and the greatest codification of laws since the fall of the Roman Empire. Napoleon was born in Corsica in a relatively modest family of noble Italian ancestry that had settled in Corsica in the 16th century. Well-educated and an avid reader, he spoke French with a heavy Corsican accent. A supporter of the radical Jacobin faction, his military skills led to very rapid promotions under the French First Republic. His fame came especially in his Italian and Egyptian campaign, against coalitions of enemies of the French Revolution. Napoleon took power in 1799 and installed himself as First Consul with few restrictions on his control of France. In 1804 he was crowned emperor of the French people. He made peace with the pope and the Catholic Church, much to the relief of the religious element. He launched a new aristocracy for France while allowing the return of most of the aristocrats who had been forced into exile by the Revolution. He fought a series of wars-the Napoleonic Wars-that involved complex ever-changing coalitions against the French Empire. With his victories at Ulm and Austerlitz (1805), he put an end to the Third Coalition, then he dissolved the old Holy Roman Empire and created the Confederation of the Rhine. However, his navy was destroyed at the battle of Trafalgar (1805) and Britain imposed a naval blockade of the French coasts. In retaliation, he established the Continental System to cut off all European trade with Britain. A Fourth Coalition was set up against France, but was defeated at the battles of Jena-Auerstedt (1806), Eylau and Friedland (1807). It resulted in the dismemberment of Prussia and the resurgence of a Polish State. At Wagram (1809), Napoleon dissolved a Fifth Coalition and secured a dominant position in continental Europe. Napoleon maintained the French sphere of influence through the formation of fluctuating alliances and the elevation of friends and family members to rule other European countries as French vassal states. When Napoleon placed his brother, Joseph Bonaparte, on the throne of Spain and tried to compel Portugal to follow his Continental System, it led to opposition in both countries and, with assistance of the British army, to the Peninsular War which drained French resources. To enforce the Continental blockade, his large-scale invasion of Russia (1809) proved to be a major military failure with his Grande Armée virtually destroyed. Most European countries then turned against him. He spent the last 6 years of his life in confinement by the British on the remote island of Saint Helena. He was the great hero of the French people throughout the 19th century, and his nephew Napoleon III built on that fame to become ruler of France, 1848-70. France , officially the French Republic (French: République française), is a sovereign state comprising territory in western Europe and several overseas regions and territories. The European part of France, called Metropolitan France, extends from the Mediterranean Sea to the English Channel and the North Sea, and from the Rhine to the Atlantic Ocean. France spans 640,679 square kilometres (247,368 sq mi) and has a total population of 67 million. It is a unitary semi-presidential republic with the capital in Paris, the country's largest city and main cultural and commercial centre. The Constitution of France establishes the state as secular and democratic, with its sovereignty derived from the people. During the Iron Age, what is now Metropolitan France was inhabited by the Gauls, a Celtic people. The Gauls were conquered in 51 BC by the Roman Empire, which held Gaul until 486. The Gallo-Romans faced raids and migration from the Germanic Franks, who dominated the region for hundreds of years, eventually creating the medieval Kingdom of France. France emerged as a major European power in the Late Middle Ages, with its victory in the Hundred Years' War (1337 to 1453) strengthening French state-building and paving the way for a future centralized absolute monarchy. During the Renaissance, France experienced a vast cultural development and established the beginning of a global colonial empire. The 16th century was dominated by religious civil wars between Catholics and Protestants (Huguenots). France became Europe's dominant cultural, political, and military power under Louis XIV. French philosophers played a key role in the Age of Enlightenment during the 18th century. In 1778, France became the first and the main ally of the new United States in the American Revolutionary War. In the late 18th century, the absolute monarchy was overthrown in the French Revolution. Among its legacies was the Declaration of the Rights of Man and of the Citizen , one of the earliest documents on human rights, which expresses the nation's ideals to this day. France became one of modern history's earliest republics until Napoleon took power and launched the First French Empire in 1804. Fighting against a complex set of coalitions during the Napoleonic Wars, he dominated European affairs for over a decade and had a long-lasting impact on Western culture. Following the collapse of the Empire, France endured a tumultuous succession of governments: the monarchy was restored, it was replaced in 1830 by a constitutional monarchy, then briefly by a Second Republic, and then by a Second Empire, until a more lasting French Third Republic was established in 1870. By the 1905 law, France adopted a strict form of secularism, called laïcité , which has become an important federative principle in the modern French society. France reached its territorial height during the 19th and early 20th centuries, when it ultimately possessed the second-largest colonial empire in the world. In World War I, France was one of the main winners as part of the Triple Entente alliance fighting against the Central Powers. France was also one of the Allied Powers in World War II, but came under occupation by the Axis Powers in 1940. Following liberation in 1944, a Fourth Republic was established and later dissolved in the course of the Algerian War. The Fifth Republic, led by Charles de Gaulle, was formed in 1958 and remains to this day. Following World War II, most of the empire became decolonized. 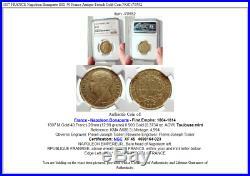 World-renowned expert numismatist, enthusiast, author and dealer in authentic ancient Greek, ancient Roman, ancient Byzantine, world coins & more. Ilya Zlobin is an independent individual who has a passion for coin collecting, research and understanding the importance of the historical context and significance all coins and objects represent. Send me a message about this and I can update your invoice should you want this method. Getting your order to you, quickly and securely is a top priority and is taken seriously here. Whether your goal is to collect or give the item as a gift, coins presented like this could be more prized and valued higher than items that were not given such care and attention to. When should I leave feedback? Please don't leave any negative feedbacks, as it happens sometimes that people rush to leave feedback before letting sufficient time for their order to arrive. The matter of fact is that any issues can be resolved, as reputation is most important to me. My goal is to provide superior products and quality of service. How and where do I learn more about collecting ancient coins? Visit the Guide on How to Use My Store. For on an overview about using my store, with additional information and links to all other parts of my store which may include educational information on topics you are looking for. 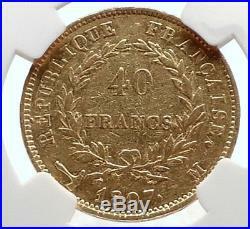 The item "1807 FRANCE Napoleon Bonaparte BIG 40 Francs Antique French Gold Coin NGC i70552" is in sale since Friday, July 6, 2018. 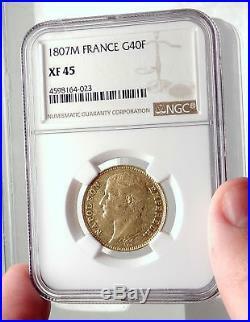 This item is in the category "Coins & Paper Money\Coins\ World\Europe\France". The seller is "highrating_lowprice" and is located in Rego Park, New York. This item can be shipped worldwide.